2 lovely cards Sylvie, I especially like the green one. Lucky you being in UK, I have only been back 3 weeks and already missing family. Two fab cards Sylvie...pleased you enjoyed your trip to the UK and hopefully you came home with lots of new crafting goodie? oh sylvie... both cards are absolutely gorgeous!!! the first one really caught my eye. i love the little touches of red on the one tree! 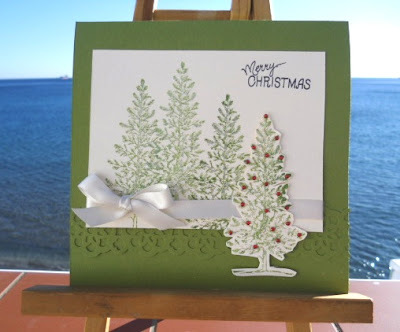 I just love trees and these cards are super... I think the first one just has the edge for me. Hi Sylvie, glad you had a good trip. It's freezing here today! Two gorgeous cards! Love the cut out tree at the front. Tilly sends a big cuddle!! Super cards Sylvie, I really cannot decide! Two beautiful cards. Loving your tree stamp and ribbon detail. 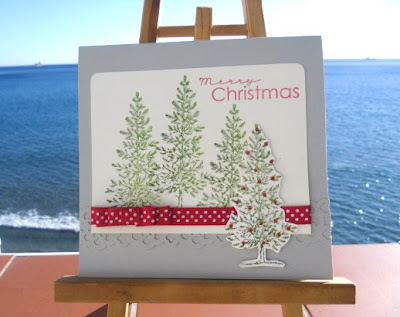 It seems weird to see Christmas cards that have a backdrop that I normally associate with a summer holiday!! LOL!! Two great cards, love the 3d trees with the bling! Lucky you with the weather...still it wouldn't be Christmas without the rain and cold!! !